Denmark's many charms have become apparent to a global audience, particularly in recent years. Scandinavia's "European" wing boasts glorious beaches, beautiful fairy-tale castles, lush forests, a temperate climate, friendly citizens, and a joie de vivre that's infectious. Smash TV series Borgen made a star of Copenhagen's attractions - in particular, the magnificent parliament buildings at Christiansborg. Similarly, Danish/Swedish collaboration Bronen (The Bridge) showed the world the Oresund Bridge, a stunning feat of engineering, which links the two countries by road and rail. For lovers of literature, a visit to Odense, the hometown of master storyteller Hans Christian Andersen, is a must. Denmark's eco-credentials are obvious throughout the land. In Copenhagen, the bicycle takes precedence over the car and is arguably the best way to explore this compact, picturesque city. On top of all this, the food is legendary - Danish fine dining paves the way for the best of Scandinavian cuisine. When visiting Copenhagen, many visitors make a beeline for this iconic recreation space. Dating from 1843, Tivoli is the inspiration behind the world-famous Disney theme parks, and here, you'll find a huge range of attractions including a roller coaster, roundabouts, puppet theaters, restaurants, cafés, gardens, food pavilions, and even a Moorish-styled concert hall. Known across the world, Tivoli has appeared in numerous movies and is a true symbol of the city. At night, firework displays illuminate the sky, and in winter, the gardens are adorned with lights for the Christmas season. During the summer, you can catch free rock concerts on Friday nights. The star of countless images and postcards of the city, Nyhavn (New Harbor) is a great place to stroll or grab a slice of Copenhagen café culture. Located to the rear of Amalienborg Palace, this was once a disreputable stretch of dockland but has been given a new lease of life with its multi-colored houses, restaurants, and tall ships (some of which are museums) dotting the quayside. Nyhavn is now a particularly charming quarter and consequently a major draw for tourists and locals alike. If you're feeling adventurous, you can catch a hydrofoil to Sweden from here or grab a pleasant harbor cruise to see the sights. A ten-minute stroll from Tivoli Gardens leads to the National Museum (Nationalmuseet), which delves into Danish history and culture. The museum displays an impressive collection of Danish artifacts, including a 2,000-year-old sun chariot, Danish porcelain and silver, and Romanesque and Gothic church trimmings. Other collections highlight clothing from the 18th and 19th centuries, as well as antique furniture. Supplementing this journey back through Danish history is an excellent ethnographic exhibition with items from Greenland, Asia, and Africa, among others. At the Children's Museum, kids will find plenty of things to do. They can dress up in period costume, climb aboard a Viking ship, and visit a 1920s-style classroom. The National Gallery of Denmark houses the country's largest collection of Danish art. The original exhibits were once housed at Christiansborg but moved to the current location in the late 19th century. A gigantic extension has not only significantly extended the space but allows natural light to flood into the interior of the museum. Covering more than 700 years of European and Scandinavian art, the museum displays paintings by the Dutch Masters, Picasso, and Edvard Munch among others. Not surprisingly, fine collections of Danish art are also on display. The café is particularly pleasant and a great place to unwind and soak up the surroundings. On the tiny island of Slotsholmen in the center of Copenhagen, you'll find the Danish seat of government. Boasting more than 800 years of history, Christiansborg is the power base of the kingdom of Denmark and now home to the Parliament, the Prime Minister's Office, and the Supreme Court. Fans of the TV series Borgen will be familiar with the setting. Several wings are still used by the Royal household, and much of this is open to the public. Bishop Absalon built fortifications of the city here in 1167, and visitors can see ruins of the bishop's castle, which was destroyed in the 14th century, as well as the medieval fortress. The stunning Frederiksborg Palace was built by king Christian IV in the early 17th century and has hosted Denmark's Museum of National History since 1878. The museum's collections focus on artwork that illustrates the country's history and includes a robust assortment of painted portraits, photography, and prints. The museum also includes a tour of the castle's interior, where visitors can explore the rooms that once hosted royalty and nobles. The palace's exterior and grounds include highlights like the Neptune Fountain, a pair of round towers once occupied by the court scribe and sheriff, and a beautiful relief depicting the deities Mars and Venus, which is located on the façade of the Audience House. Tourists can also freely explore the various paths and gardens surrounding this Renaissance palace. The LEGO House in Billund, the birthplace of the iconic LEGO brick, is a family attraction that all ages will enjoy. Those on a budget or just quickly passing through will appreciate the admission-free areas, which include nine themed playgrounds; three outdoor squares; and the Tree of Life, a 15-meter LEGO tree filled with details. Tourists can also choose to buy admission to explore the Experience Zones, each representing the classic brick's colors - Red for creativity, Green for role playing, Blue for cognitive challenges, and Yellow for emotions. Visitors also have a chance to learn all about the history of LEGO and its founders. Decades in the planning and often controversial, the Oresund Bridge has quickly become a Scandinavian icon. The bridge is around 10 kilometers from Copenhagen, and you can either drive across or take the train. On the Danish side, it starts out as a tunnel so as not to interfere with flights to and from adjacent Copenhagen Airport. The eight-kilometer structure opened in 1999 and now links the island of Zealand, Denmark's largest island and home to Copenhagen, to the southwest coast of Sweden, specifically to the port of Malmo, Sweden's third largest city. Fans of Scandi-noir will know that the Oresund Bridge has recently gained much global infamy as the central focus of the smash hit Danish/Swedish TV drama The Bridge. Just over 15 kilometers outside Copenhagen, you'll find Lyngby Open-Air Museum, part of the Danish National Museum, and a must-see for many visitors to Denmark. Occupying 35 hectares, there are authentic farmhouses, agricultural buildings, dwellings, and mills from across the country in this "living museum." There are also ancient breeds of domestic animals, magnificent historic gardens to wander through, atmospheric old houses from Schleswig-Holstein and Sweden, as well as numerous picnic sites. You can even take a horse-drawn carriage around the grounds. Kronborg Castle is not only the setting of Shakespeare's Hamlet, but also a UNESCO World Heritage Site. Consequently, it scores top billing on Helsingor's list of must-see sights. Even those with just a passing interest in the bard will surely want to visit. The imposing structure is clearly visible as you approach, so you can't really miss it. The present incarnation dates from 1640, although several other fortresses preceded it. Serving as a garrison for a century or more, the castle was renovated in 1924. In the South Wing, you'll find the Castle Chapel, which survived a fire in 1629 and has a magnificent Renaissance interior with German wood carvings. The North Wing contains the great Ballroom or Knights' Hall, while exquisite tapestries are displayed in the West Wing. Fairy-tale Egeskov Castle lies in a beautiful setting less than 30 minutes' drive from Odense and is the best preserved moat-castle in Europe. The superb Renaissance structure as seen today was completed in 1554 and originally built for defense purposes. Over the centuries, the castle has changed hands many times and later became a model farm. In 1959, the grounds opened to the public, and much renovation and development has taken place since. A Vintage Car Museum opened in 1967, and other attractions include a treetop walk and Segway tours. The Banqueting Hall is simply magnificent. A visit to Egeskov is a wonderful day out, particularly for families. You can't visit Denmark without being aware of Hans Christian Andersen. His fairy tales and stories are woven into the fabric of Danish society. The museum dates from 1908 and is dedicated to the writer's life and work, with displays of artifacts, mementos, and Andersen's own sketches and artwork. Listening posts and interactive installations bring the writer's words to life, and the domed hall is decorated with scenes from Andersen's autobiography Story of My Life. To the southwest of Odense Cathedral, in Munkemøllestræde, you'll find Hans Christian Andersen's childhood home (Andersen's Barndomshjem), which is also part of the museum. The Viking Ship Museum in Roskilde gives tourists the unique opportunity to see firsthand how the Vikings constructed their boats and how modern shipbuilders are restoring and repairing the vessels that have been unearthed. The boatyard, which is located next to the museum, uses traditional methods to create reproductions and bring old boats back to life. Inside the museum, visitors will learn about the Viking Age and the central role that maritime life played in the culture and survival of the people. The central exhibit, Viking Ship Hall, features five ships once used by the Vikings to form a barrier on Roskilde Fjord. After extensive and painstaking underwater excavations, the ships were restored and are now on display. One of the museum's newest additions is the high-tech "Climb Aboard" experience, where tourists are fully immersed in life aboard a Viking ship. This interactive experience is complete with costumes for those who want to really dive in, as well as the opportunity to explore the ship's rooms and supplies and even experience sensory changes as the journey takes you through day and night, rough seas and calm, and all sorts of weather. Aarhus' living history museum, Den Gamle By, provides visitors with an authentic re-creation of not just one era in Danish history, but three distinct decades. Divided into three neighborhoods, you will find representations of life in Denmark during the mid-19th century, the 1020s, and 1974. Each detail, from the architecture and roads to businesses and domestic lives of the costumed interpreters, illustrates how life has changed over time and the ways that some traditions have remained sacred. In addition to the living history neighborhoods, Den Gamle By is home to several individual museums including Musaeum 1927, the Danish Poster Museum, Toy Museum, and the Gallery of Decorative Arts. Nearby, in the suburb of Højbjerg, the Moesgaard Museum delves even further back in time with in-depth exhibits on the progression of cultures in Denmark through the Stone Age, Bronze Age, Iron Age, and Viking Ages, plus an exhibit about medieval Denmark. Well worth scaling for the excellent panoramic views, the Round Tower (Rundetårn) is 36 meters high and was built as an observatory in 1642. Here, you'll find a small collection connected with the famous Danish astronomer Tycho Brahe, however the highlight for most is the viewing platform reached by a spiral ramp. A glass floor hovers 25 meters above the ground, and not only can you gaze out over the rooftops of Copenhagen city, but also peer down into the castle's core. A short walk through the surrounding old town takes you to Gråbrødretorv, one of the city's most picturesque squares. In the Frederiksstaden quarter of Copenhagen, you'll find Amalienborg Palace and its tranquil gardens by the water. Originally built as residences for the nobility, the four palaces face onto the square. The Danish Royal Family took occupancy after a fire at Christiansborg in 1794, and the palace remains their winter home. The identical palaces form an octagon, and it's claimed the design is based on plans for a square in Paris that later became the Place de la Concorde. Built in a light Rococo style, the buildings combine both German and French stylistic elements. The Soldiers of the Royal Guard, in their bearskins and blue uniforms, are a particular draw for visitors. The Kingdom of Denmark also encompasses two autonomous countries: the far-flung Farøe Islands and Greenland. Lying some 600 kilometers west of the Norwegian coast, the Farøe Islands (Sheep Islands) is an archipelago of 18 remote islands. Landscapes range from steep rocky coasts, meadows, and mist-cloaked hills to fjords that bite deep inland. The Gulf Stream moderates the temperatures on land and at sea and attracts a diversity of marine life, including seals, whales, and many species of fish. Anglers come here to cast their lines in the crisp, clear waters, and birders can admire some of the 300-plus species including puffins and guillemots. A boat trip to the Vestmanna bird cliffs is a highlight. The Farøe Islands also boast a lively music scene with many festivals in the summer. 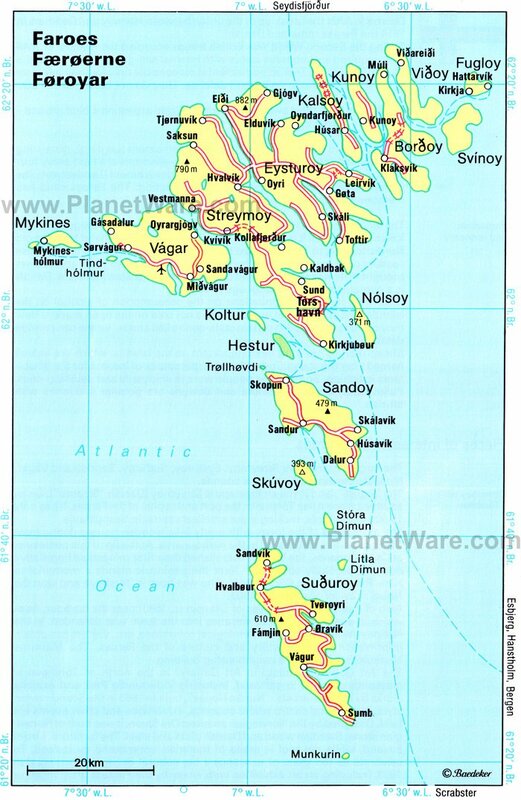 To the north and northeast of Eysturoy, one of the archipelago's largest islands, lie many sizable and smallish islands. Blessed with a natural harbor surrounded by emerald hills, Klaksvik on Bordoy is the second largest town in the Farøes. Tourist attractions include the history museum and the Christian's Church (Christians-kirkjan) with a boat hanging from its ceiling, the only one of four to return safely on a stormy winter's night in 1923. To access the Farøes, you can fly to the airport on the island of Vågar year-round from Copenhagen or hop aboard a ferry from several Danish ports to Torshavn, the capital, on the island of Streymoy. In and Around Copenhagen: It's no secret that a large number of Denmark's top tourist attractions are in its largest city, Copenhagen. Despite its position on the eastern coast, Copenhagen is a great starting point for many day trips, including visits to traditional fishing villages or a hop across Oresund Bridge to Sweden to see the highlights of Malmö. A Land of Fairy Tales: Best known as the birthplace of Hans Christian Andersen, perhaps the most famous of all fairy-tale writers, Odense is a magical place with a rich history. Nearby, Egeskov Castle could easily have been the setting of some of his tales, and there are plenty more attractions to be found in Helsingor, where you will find Hamlet's Kronborg and the stunning Frederiksborg Castle.